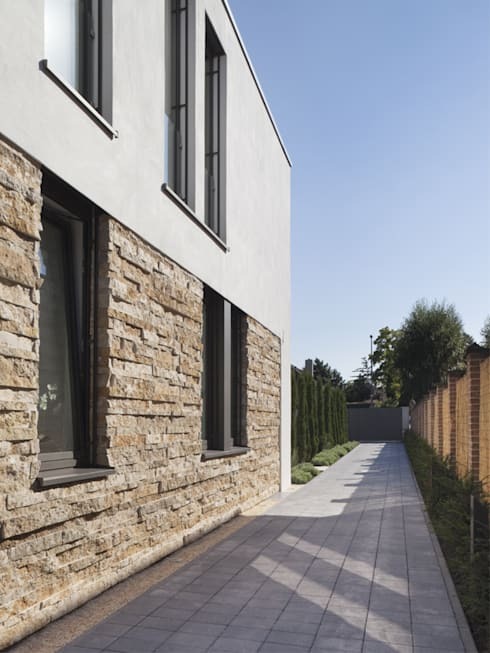 Home D by Skandella Architects, based in Germany, is a modern masterpiece. As you will see when we take a tour of this home and its grounds, the structure is a bold and geometric form and in a very minimal style. This feat of modernity takes up 330sqm and was completed in 2010 for a private client. The residence adheres to a strong minimalist ethic but, as we will see later on, the architects have brought in beautiful natural elements to offset the modern edge, thus giving it a warmer appearance. In the end we find a home that does not sacrifice comfort and familiarity for modernity. From the back yard of the home we can see this grand house beautifully illuminated by soft and strategic lighting, both inside the house and out. We can see here that the house consist of basically two white masses, the one of which extends beyond the other and housing a covered veranda. The recessed of the two masses gives way to a deck and an ever-impressive swimming pool. Between these two areas, as well as ample lawn space, enough recreation area is ensured for all the inhabitants' entertainment needs. The sharp, white and clear surfaces of the painted concrete is offset by stone paving insets on the lower level of the home. The stone here adds a natural look to complement the modern façade and bring a taste of the eclectic to the scene. The manner in which the stone is paved only in what looks to be an inset, provides a visual interest with this innovative and blocked design. The jagged quality of this part of the wall provides an intense sense of texture which is generally lacking in the otherwise modern building material. This is a simple way to bring in tactile interest without compromising the modern look of the design. The interior of the home yields a pristine white space accentuated with strategically placed metal elements. Here in the entrance hall we can see this effect in full force. It seems that if it were not for the metal fixtures and lighting, that the space would have been indistinguishable in its dimensions. The white surfaces thus provide that clean, modern look, whilst the fixtures are tactically employed to add depth to the room. The result is a very light and bright area which seems to extend beyond its dimensions, and looks all but two-dimensional. The stairs form part of a straight staircase to the second storey. 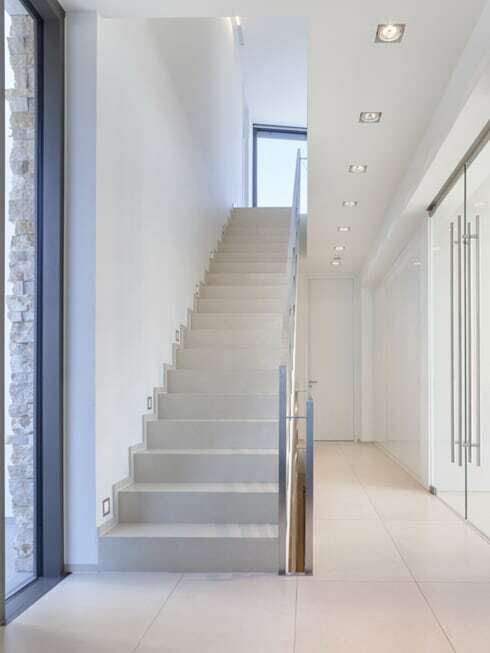 This does not usually allow for too much privacy between two levels, but as we can see here, the architects circumvented this problem by placing the staircase against a wall and landing in a corner, as not to reveal to much of what goes on beyond. Let's go straight to the kitchen area. I think you will agree that it is a spectacular space to find ourselves in. Here we can again see the brilliant and omnipresent white. 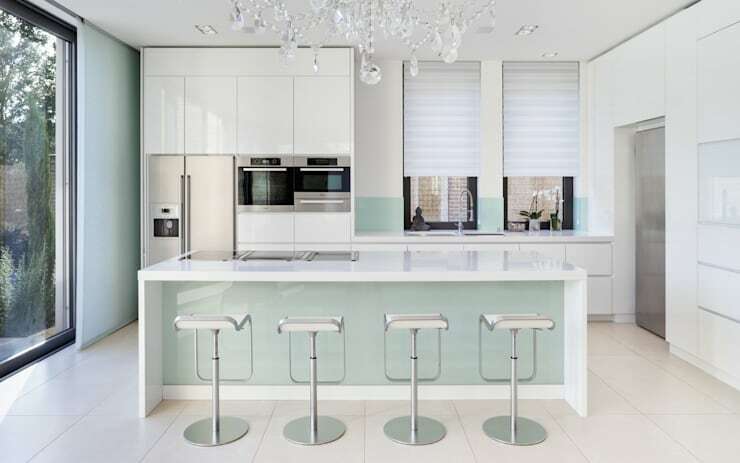 This space, however, is subtly highlighted by different white hues to create contrast between different areas. There is also a splash of very light and opaque blue to add just that touch of interest. The kitchen is rather compact and open-plan, but it does allow for all of the amenities and necessary work space for any food-lover's needs. The kitchen is streamlined with the kitchen appliances incorporated into the cabinets and ensuring seamless integration into the larger kitchen ensemble. 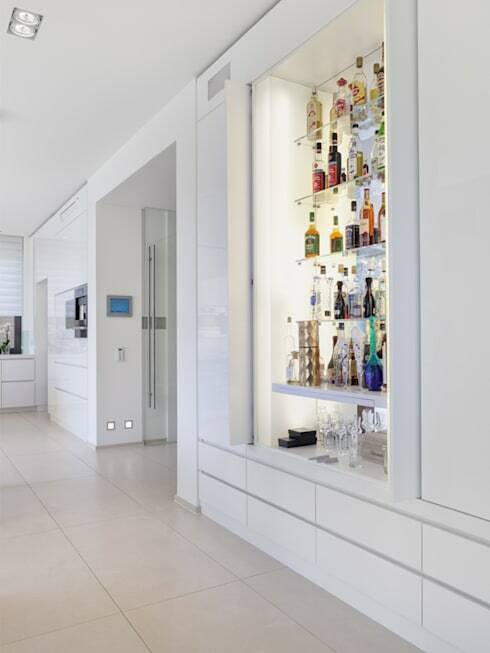 Moving over from the kitchen into the living room and larger entertainment area, we find a beautiful display case that here houses a very well-stocked liquor cabinet. The large, recessed display unit is not only highly functional, but also provides a decorative element. This unit is definitely indicative of a space ideal for endless parties and sociable dinners. As we can see here, the white theme and style of the house is not broken. Rather, the use of objects, such as liquor bottles, are used to decorate the space and bring in colour to the white background. The living room offers the perfect spot for relaxation and unwinding after a tough day. It is a spacious room which allows much light to enter through windows around the boundary of the back wall. The rest of this wall is covered with the natural and jagged stone that we saw on the the side of the building's exterior. 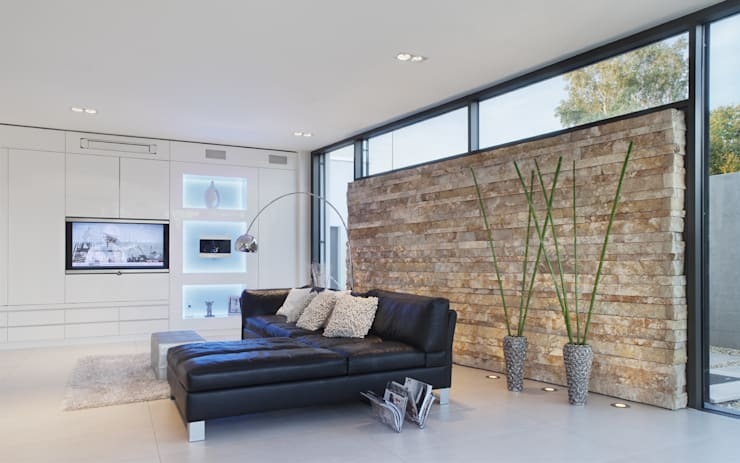 This brings some continuity between the inside and outside of the home, and repeats the natural element as supplement to the bold, modern materials otherwise used. A large, L-shaped leather couch is situated in the room, removed from the back wall. This floating placement of this piece of furniture allows for the space to feel bigger and with much more possibilities for movement. Lastly, we find ourselves in the large, family bathroom. 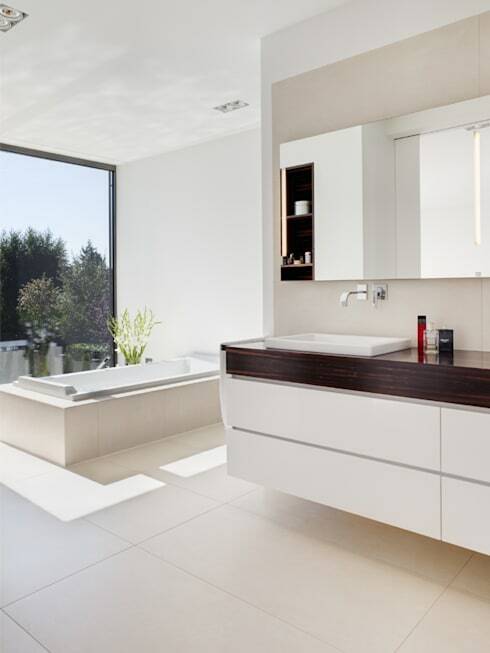 Unsurprisingly, it is completely white, excluding the basin counter, which is made of dark timber. This is a stark contrast to the white of the rest of the room, and allows a counterbalance to the large open space where the bathtub is located. Speaking about the bathtub, this luxury fixture is situation in front of a large window, offering scenic views to the outside landscape. Making use of this bathroom must leave all feel refreshed and revitalised, offering not only the cleansing of the body, but also of the mind. If you were inspired by this home's all-white interior, you should check out: All White Is Better Than All Right! Would you enjoy living in such a glamorous home? Let us know your thoughts!